Providing design input early in the process can impact a building’s construction cost and performance. A new building’s configuration is the single most important factor leading to a successful project. As part of our spectrum of services, Structural Focus provides design and engineering for new buildings. This process requires an understanding of the client’s vision and needs as they correspond to the structural and seismic requirements of the project. 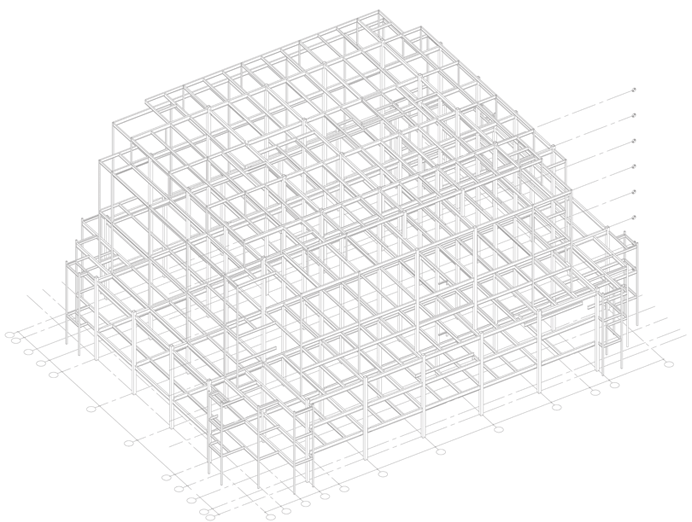 Structural Focus strives to find the best solutions, both in terms of design feasibility and budget, on every project. Sony Pictures Akio Morita Bldg. Clients appreciate our extensive experience working on projects incorporating unique acoustical requirements. This expertise also extends to the design of performance spaces and movie theaters. Existing buildings must be properly evaluated to determine their true performance when subjected to future seismic loading. An accurate assessment of the existing structure is required, then prudent modifications can be developed to meet the client’s goals. Structural Focus is highly recognized for their work on historic buildings. Our expert understanding and appreciation of archaic construction materials, as well as our experience with the Historical Building Code and the Secretary of the Interior’s Standards, make us uniquely qualified. Our team has rehabilitated hundreds of existing buildings, including nearly two dozen on the National Register of Historic Places. Existing buildings must be properly evaluated to accommodate the needs of a tenant and determine their true performance when subjected to future seismic loading. An accurate assessment of the structure is required, then prudent modifications can be developed to meet the client’s goals. Whether it is a new building or an existing facility, specific educational functions require special spaces. Working closely with the architect, the structural engineer must accommodate those needs while recognizing the students’ safety needs. Single family homes are very personal and important to their owners. While owners may not always completely understand the design and construction process, the team must recognize the owner’s needs and guide them. Changes should be expected and flexibility is key. Structural Focus has collaborated on multiple projects with notable architects including KAA Design Group, Marmol Radziner Architecture, Kelly Sutherlin McLeod Architecture, Peter Marino Architect, and Landry Design Group, among many others. Structural Focus uses the latest technologies to provide expert services to clients, such as corporations, lenders, and realtors, during the site selection process and produces seismic risk assessments for the purchase and/or refinancing of existing buildings. CRESA Partners, Lowe Enterprises, Caruso Affiliated, and many others. The Back to Business (B2B) Program allows building owners to retain qualified structural engineers to create building-specific post-disaster inspection plans. The engineers are ready and “on call” to inspect the identified buildings following an earthquake or other disaster. B2B Programs promote occupants’ safety, reduces business interruption, and supports our communities’ resilience. SAFEq Institute™ is an expert resource for local jurisdictions seeking to minimize facility and business interruption losses caused by disasters. SAFEq Institute provides organizational assistance as well as training of individuals to provide emergency structural inspection and evaluation of buildings and other structures affected by disasters such as earthquakes.